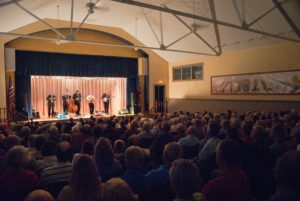 Michael Cleveland & Flamekeeper: An Appalachian Evening’ Summer Concert. Michael Cleveland is one of the premier bluegrass fiddlers of his generation and, with ten International Bluegrass Music Association (IBMA) Fiddle Player of the Year awards under his belt, he is the most awarded and celebrated fiddler in the history of Bluegrass music. Cleveland plays with such fire, drive and virtuosity that audiences are often left shaking their heads in amazement. Together with his band Flamekeeper (four-time IBMA Instrumental Band of the Year award winners) Cleveland delivers some of the most powerful, exciting and authentic bluegrass you can find. Adults $25; Students/K-12 $10; plus tax. All concerts at 7:30 pm in the air-conditioned Lynn L. Shields Auditorium. Dinner available for purchase in the Schoolhouse Cafe beginning at 6 pm. Featured artist: Carmen Holland.